As a professional China custom keychain manufacturer, we are committed to providing a variety of innovative design and fashion style of key chains. The PVC keychain is a kind of our customized keychain products. On the surface of PVC keychain, we can accord your need to custom print letters or logo, can also customize the PVC ornament as you want. Some of our PVC keychains also have other fascinating design, such as LED light. 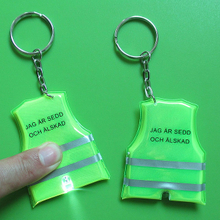 We insist on providing you with novel and practical key rings. The custom PVC keychain is cheap and nice, it has good service performance, whether for hanging keys, or hanging U disk, bottle, satchel. If you are looking for good key rings as your promotional gift, you can choose our PVC keychain, the felt keychain, PVC rubber keychain and metal keychain are also good choice for you. We guarantee the quality of all products, just choose the material and shape you want.